Want to make fast money selling YOUR junk car in DFW? We can help! Why call us? Simple: We specialize in ugly car buying! Not running? It's cool! No hassle, no middlemen, no B.S. 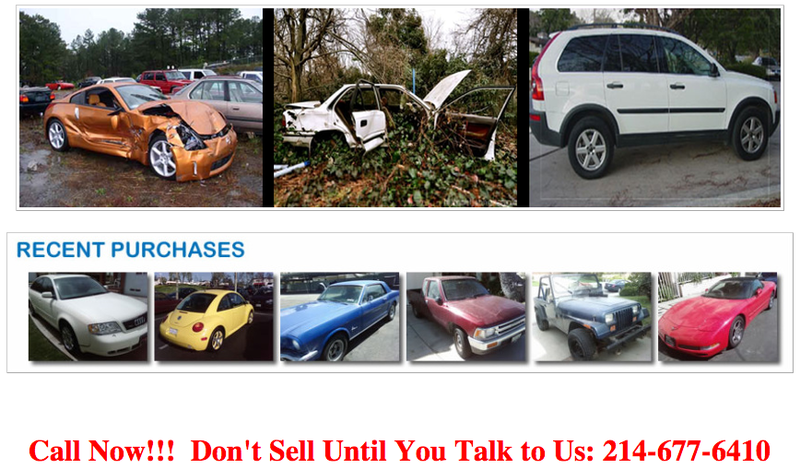 Want to know where to sell your junk car in Dallas? Right here! That's where we come in - N.T. Auto Buyers is a locally owned company specializing in junk car removal in Dallas-Fort Worth. When you call us, you deal directly with a friendly, knowledgeable and professional car removal expert. Let us show you what countless car sellers in DFW just like you already know: We pay the most for junk cars and offer same-day haul away service. You get rid of that clunker and get cash in hand! Brands of cars, trucks, SUVs and RVs that we buy include Audi, Benz, BMW, Ford, Chevy, Jeep, Chrysler, Dodge, Saturn, Mitsubishi, Lexus, Honda, Toyota, Volkswagen, Porsche, Infiniti, Nissan, GM and more. Luxury cars also welcome. If you have hail damage, our friends can help. Also, for mobile mechanic help, you may contact S & L Auto Repair for at-home work if you live in north DFW. Car care tip - Testing for a good ground: Every electrical device requires a good ground connection to the car's metal panels, frame or engine. If electricity flows to an accessory that does not work, do not replace it until you can test it with a substitute group connection. To create the alternate ground, attach one alligator clip of a jumper wire to the grounded connecting terminal of the accessory and the other aligator clip to a nearby bolt or metal part of the car. If the accessory now works, repair or replace the original ground wire or make a new ground for the circuit. If the accessory still doesn't function, it will need to be replaced. Making a new ground on a used car: If the ground wire of a junk care connecting terminal on the car's metal frame, panel or engine is corroded, as is the case with many junk cars in the Dallas area, but the wire itself is good, cut the wire off its corroded terminal. Find and remove an un-corroded metal bolt or screw that is attached to the car's metallic body and which the wire can easily reach. Measure the circumference of this new fastener and buy an appropriate size round terminal. Attach the new terminal to the end of the wire. If the wire is damaged or will not reach the grounding fastener in your vehicle, splice a new length of wire of the same gauge to a good section of the old, or replace the wire and its terminals entirely. To test an accessory (the car's windshield washer, for example), turn on the ignition and then attach the aligator clip to a ground and touch the probe to the hot wire connector on the car's motor. We also buy trucks and other junk vehicles across all suburbs of DFW including Allen, Plano, Frisco, McKinney, Richardson, Irving, Coppell, Carrollton, Lewisville, Grapevine, Kaufman county, Ennis, Red Oak, Grapevine, Lake Dallas, Prosper, HEB and the mid cities, Little Elm, Wylie and more. Auto salvage help upon request. We service the entire metroplex (see below) and will show up at your place upon request and handle haul away and towing. If you are heaving problems with your old car, visit our troubleshooting guide for some basic ideas on how to salvage it. We look forward to hearing from you soon! Remember, we offer same-day service in most cases.